Here's your latest weekly dose of inspiration from Creative Late Bloomers who first found success in their 40s, 50s, 60s, 70s, 80s and even 90s and who are still going strong. Last week we featured 96-year-old memoirist Diana Athill. This week's selection, Carmen Herrera is still painting at 98. HER LATE-BLOOMING STORY: Although she began painting in her 20s, Carmen Herrera did not sell a painting until she was 89 years old. Now she is considered a pioneer of Geometric Abstraction. Her paintings hang in the Museum of Modern Art in New York and the Tate Museum in London. UPCOMING: Our America: The Latino Presence in American Art at the Smithsonian American Art Museum in Washington D.C. from October 25, 2013-March 2, 2014. This exhibit is scheduled to travel to The Patricia and Phillip Frost Art Museum at Florida International University in Miami (March 28, 2014-June 22, 2014); Crocker Art Museum in Sacramento (September 21, 2014-January 11, 2015), Utah Museum of Fine Arts in Salt Lake City (February 6, 2015-May 17, 2015); Arkansas Art Center in Little Rock (October 16, 2015-January 17, 2016) and Delaware Museum of Art in Wilmington (March 5, 2016-May 29, 2016). ON GROWING OLD: "(Being 20) is not an easy time. A lot of things are coming to you that you're not ready to absorb. You have to get old and wrinkled and grey-haired before you know what they are talking about." NO ONE EVER SAID IT WOULD BE EASY: Born in Cuba in 1915, Carmen Herrera moved to New York with her husband Jesse Loewenthal in 1939. After World War II, the couple lived in Paris where Herrera joined a group of abstract painters and started to develop her painting style: minimalist abstracts dominated by straight lines and brilliant colors. Back in New York, she was refused a gallery show because she was a woman. She also suspected that being Cuban didn't help her either. Supported by her husband, who worked as a schoolteacher, she continued to paint, always in the same style for more than 60 years. WHY YOU SHOULD NEVER GIVE UP: Last year, Carmen Herrera's work was included in Vitamin P2, an overview of the best new contemporary paintings from around the world published by Phaidon. 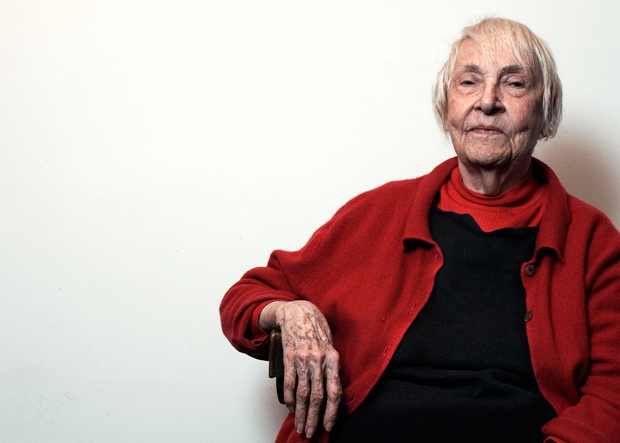 On the Phaidon website, she and others artists featured in the book were profiled. Her interlocateur concluded the interview by asking her "what next?" Herrera responded: "What a question to ask a 97 year old! However, since you asked, I will respond. I want to make larger works, but then there is the problem of getting them in and out of this studio -- the lift is tiny, the staircase crooked, and I never go out. So again, I have choices to make -- how to make them larger, or seem larger, or maybe make the world smaller?" Great artist! However, she doesn't get the recognition she deserves. Is this because she a Latina woman. We show together in 1972 and are also together again at the Smithsonian American Art Museum, Our America: The Latino Presence in American Art. Our abstract work was dismissed as second rate and derivative by the Washington Post art critic Phillip Kennicott. Please post a link to that Phillip Kennicott review.